The gap at the top has been reduced to a point – and the Coquetdalers have two games in hand. Matty Travis grabbed the opener from the penalty spot in the sixth minute and McCann stretched the lead seven minutes after the turnaround with a very calm finish from a bobbling ball in the box. Whitburn pulled one back from the penalty spot through Joe Warren late in the game, but what could have been a very nervy ending was relieved as McCann put away his killer second in the 92nd minute. “The penalty had us worried for the time that was left, but we got a break from their corner and James Jackson put an inch-perfect pass onto my boot. I rounded the keeper to make sure the three points came back to Rothbury – and the team went up a height,” said McCann. “As I say, the first line of defence is attack,” he continued, as Rothbury soaked up a huge amount of pressure while remaining dangerous on the counter. “The defence was solid as a rock and I thought Peter Waddell had a stormer, producing great saves by the number. I think at the end of the season we will look back and think it’s a great win. 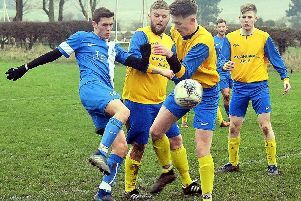 Hillmen boss Dan Herron admitted the result was ‘massive’ and that the management team had played down the significance of the fixture before the game. When McCann was sent tumbling in the area early on, Travis coolly dispatched the spot-kick into the top corner, but Herron felt that his side took their foot off the gas a little following that. “After we went 1-0 up we literally just stopped buzzing about and pressing. Whitburn were all over us for the next 35 minutes until half-time, and were unlucky to not draw level or even go ahead. They missed a header from point blank range and Travy cleared one off the line. That’s all credit to Whitburn though, their shape, work-rate and determination was of a very high standard and they caused us problems,” he continued. 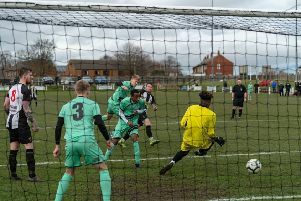 Rothbury could have added to their tally when the host’s keeper appeared to handle outside the box as McCann attempted to lob him, but the referee waved play on. “In the last 30 minutes Whitburn pressed really hard for a goal and had us under the cosh, but the lads defended really well,” said Herron. Herron is an honest lad and put his hands up to acknowledge that fellow promotion-chasers Whitburn had bossed the game for periods, while also praising the hard work that his own side had put into getting the victory.